We know it’s typical to think about Barbecues, Beers, Lamingtons and pluggers when it comes to all things Australia Day… but what about the humble meat pie? An icon in Australia, it was described by former New South Wales Premier Bob Carr in 2003 as Australia's "national dish”. So we thought, “why not indulge in the national dish on the official National Day of Australia?” And that’s how the first annual Australia Day Meat Pie Eating Contest at The Glen Hotel was born! 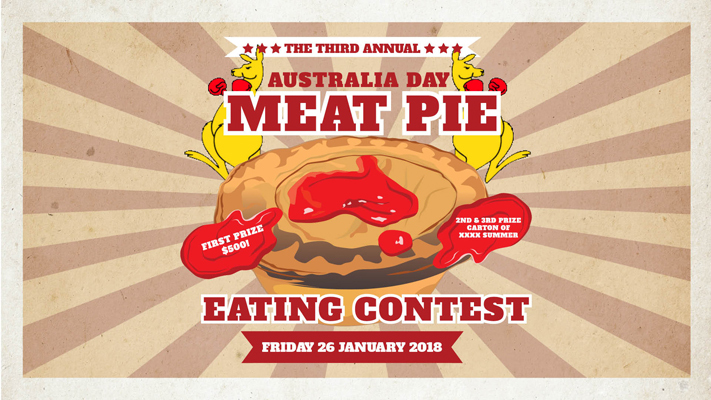 Now in its third year, it's time again to throw on your pluggers and join us for the annual AUSTRALIA DAY MEAT PIE EATING CONTEST from 2pm sharp on Friday 26 January 2018 on The Deck at The Glen. So if you think you’ve got a shot at the crown, come down and claim your throne! The aim of the game is to be the fastest in your heat at fully consuming 8 mini meat pies followed by a pot of James Squire beer to go through to the final round. The finale will sort the men from the boys and officially crown the fastest man as the Meat Pie Champion and the winner of $500 Cash!! Runners-up in the finale won’t go home empty-handed (or on an empty-stomach) - receiving a carton of James Squire beer to take home! Everyone is welcome to come down and enjoy the day’s festivities with fair-dinkum Aussie lunch specials, cold craft and local beer on tap (and show some support!). Online registration is required to enter the meat pie eating contest, registration is only $7 plus booking fee and needs to be done before the day. Thank you! Your registration for the qualifying rounds of the Australia Day Meat Pie Eating Contest was successful. We wish you luck on Australia Day! Remember to arrive at The Glen Hotel by 2pm sharp.